I got one of these its a good price - but to be honest in my opinion they are crap. Use mine nearly every day, great kit. I bought a Kenwood Frothie Drinks maker and I absolutly love it. It makes normal instant coffee tase a lot better then with a kettle. But also makes stunning capachinos. These things are the height of laziness if you ask me. It takes about 2 minutes longer to make a real coffee from a espresso machine. On top of that you get the option of about 10000 different types of coffee from around the world if you order it off the internet. Not only is it many times more superior to pod coffee but it's cheaper and easier to store. You'll wonder why you ever considered these pod machines. And if you're wondering where you can get a coffee machine for £30 then you're not looking properly. I got a La Pavoni one worth £250 for only £50 off ebay. Since starting to grind my own beans and sourcing top quality coffee rather than cheap supermarket stuff I have never bought a Star Bucks coffee again. I did go and try their free coffee that they gave out last week and thought it was awful. For those of use that don't have time to 'grind our own beans' :roll: , this is the best coffee available for your money. I have an expensive espresso machine shut away in the cupboard, but I use my Senseo every day. 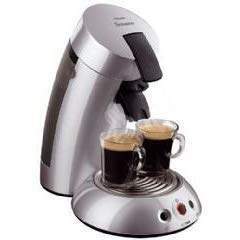 Makes a great coffee, it is very quick, and is a doddle to keep clean. the coffee it makes is not bad. we had something similar from uno uno by braun i think. personally, it is not much more time consuming to load some coffee powder in a coffee filter and get fresh coffee a lot cheaper. once you get rid of the paper filter and rinse the glass bowl, it is done. I've had one of these machines for over a year now, and I found a shop on eBay which sells different types of pods from ones you can get in England, a much better variety and they also sell a reusable coffee pod filter which sits in the two coffee pod container so you can put your own ground coffee in. A bought a load from a similar seller from Holland. Good selection of flavoured teas, coffees, cappuccino & latte. Had a cupboard full which is now dwindling. Why is is that they one sell about 3 types in the UK, when there are so many available ! We bought one of these ages ago, dissapointed becuase it only makes half a normal cup from one pod. Now it sits in the corner gathering dust. We bought one of these ages ago, dissapointed becuase it only makes half … We bought one of these ages ago, dissapointed becuase it only makes half a normal cup from one pod.Now it sits in the corner gathering dust. I found it makes a perfectly good mug of coffee even if you press the 2 cup button using a single pod. This is where I got my pods . . .
Got one of these for my home-office before Christmas when Amazon previously had them at this price and use it every day. Currently working through the "Super Testpackage" from ]http//ww….uk (Holland) but there are various other pod vendors, such as ]http//ww…uk/, who have a very tempting "Biscuits, Sweets & Chocolates" section! Anyway, it's a good price, it's a semi-expresso sort of coffee, which I like, and it's very low-hassle, which may or may not be important to you. The missis or the coffee machine? Got one of these for my home-office before Christmas when Amazon … Got one of these for my home-office before Christmas when Amazon previously had them at this price and use it every day. Currently working through the "Super Testpackage" from ]http://www.coffeepodshop.co.uk (Holland) but there are various other pod vendors, such as ]http://www.discountcoffee.co.uk/, who have a very tempting "Biscuits, Sweets & Chocolates" section!Anyway, it's a good price, it's a semi-expresso sort of coffee, which I like, and it's very low-hassle, which may or may not be important to you. I agree with the positive comments about these makers, makes a very nice cup of coffee. I would be wary of using coffeepodshop if you want quick service though, my order of two weeks ago still hasnt arrived. We use ours everyday; although the Senseo Cappuchino were complete *****. I got some other pods from double_dutch_coffee on fleabay and the delivery was reasonable and very quick. Try the Nescafe Cappuccino pads, much better IMO, if a little too sweet. They do make the room smell nice with the fresh coffee smell. I've also used the re-usable pods, bought from eBay from a German trader, pack of two for a few quid. They are Brilliant, and make a cup of coffee cost just a few pence. Some of the pods can work out at 30 or 40p a cup. Not bad for a real cup of coffee without filling a whole jug in a normal coffee maker, but the re-usable pods are best of both, and you get to choose exactly what coffee you want, instead of relying on the poor selection in supermarkets, or having to order online for the good stuff. Gonna get one of these machines for work, since they just hiked up the price of coffee in the crap machines here.